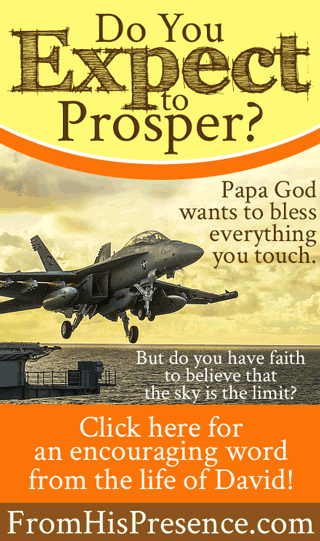 Do You Expect to Prosper? David had success in all His undertakings. ALL. Don’t think he didn’t know the Lord was with him. He knew. He depended on the Lord and knew Him intimately. You don’t rush giants with nothing in your hand but a sling and a stone if you don’t fully expect the Lord to be there to back you up! Well, the Lord is with you too. But I’m wondering if there could be a key difference that causes us to have different results sometimes than the results David had? That key difference being: do you expect to prosper? I EXPECT to prosper. I haven’t always had this attitude, but I do now and I’m asking the Lord to purge me and expose any areas in which I don’t yet expect to prosper. Because, folks, the hand of the Lord is not shortened, that it cannot save. He is WELL ABLE to do everything for you and me that He did for David. But Papa responds to faith. Do we have faith that He will prosper us? That He will come up behind us in everything we do as we follow Him, and bless it? Or do we only wish to prosper but expect to fail? You could be anywhere on the spectrum. But wherever you are, I feel in the Spirit that it’s time to increase our level of EXPECTATION. “Father God, in Jesus’ name, I thank You that You are no respecter of persons. What You did for David, You will do for me. Therefore, since Your Spirit lives inside me too, and You are with me, I ask that You would make me successful in ALL my undertakings today. Rush upon me and through me, and literally do the work through me. Help me to do what You do and say what You say, and humble myself before You, receiving from You by grace, as You pour out on me and bless me. Will you change your expectations and start expecting to prosper–or to prosper in greater measure–today? If so, leave a comment below! Partner update: I need 1,000 partners to share in this Gospel work in the amount of $8 per month. 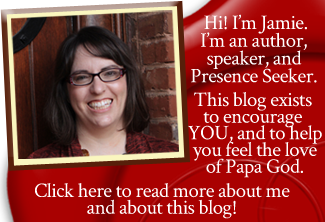 Is God calling you to partner with me in this ministry? If so, please click here to read the details. And partners: THANK YOU. I am more thankful for you than words could ever express, and I pray for you daily. I want to prosper now. It has not occurred to ask. I thank the Lord for your life in bringing up this prayer topic. Lord please increase my faith to understand and trust you more. Please l need you fervent prayer to support me in prayer for my daughter Miriam to have a good paid job that will allow her to be off from work on weekends. She is a single parent now. It definitely is! It is His will for you to prosper and be blessed in ALL things! I expect to prosper in the long term and change my state of mind to success instead of failure. Lord I expect to prosper and also renew my mind to grow in faith and leave dought, please pray for me so that God will show me the secret to my destiny. I have read your blog the other day that says we should start to look into those smaller things that we fail before and start doing them . That blog was talking about your dream of birds that were in the cage it really touches me and I am about to start a small business , I am a mother and my husband has been out of work for several years, so though I don’t have enough funds to start the business but I be alive and have faith that papa God will make a way since he is the provide and I b ealieve in miracles. Have a happy Sunday, and I love reading your blog. Have a wonderful day and thank you so much for sharing! May you be blessed in everything you do. Hi, Jamie, thank you for this. I am behind on emails – I set aside ones that I want to read later and this was one of them. I am believing the Lord will give me a new car. I felt impressed to go find the one I want on the internet which I did. I wrote the make/model and accessories down, even the color! I have increased my giving planting seeds for this car. A couple of weeks after I picked out the car, my daughter came by to give me a shirt. She asked me to go outside and see her new car. It is the exact same car I am believing for! I saw this as a confirmation from the Lord and I was and still am so blessed by that. She is paying for car but I believe the Lord was in the purchase of that car to show me He is hearing me and I will have it! Jamie – thank you. I expect to prosper now. I have always believed our Father God is a provider – I just needed to hear the difference between expecting and wishing….God is Love and He loves us…and I am part of us….and He pours His blessings on me and us always…I know God can and will…Father God _ I expect my financial miracle today because I know YOU can and will just like You have for others…Be still and know that I am God…Thank you Father.